We’re getting a bit of snow, so I thought a loaf or two of bread might be in order. The call for snow around here always sends the populace into a tizzy, so I ventured out early to get the weekly shopping done – I did not want to have to deal with the last-minute panic shoppers. We didn’t need much, but I had to get a few things for Victor’s mom – things that can only be found at the local Acme – pronounced AK-A-ME . They were already starting to assemble at 8:00am – so much for beating the crowds – but I was in-and-out in a reasonable amount of time for it being an Acme. The flakes started to lightly fall as I set off to make some bread. 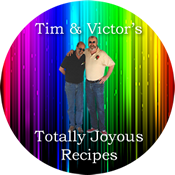 I’m continuing my fixation with The Great British Bake Off and found another recipe from Richard Burr of UK Season 5/US Season 1 that looked like fun. I’ve baked a few loaves of bread in my time but have almost always used an industrial mixer at work or my Kitchen-aid mixer at home for the majority of the kneading, with just a bit of a hand-knead to make sure it felt right. If you bake enough bread, you learn to feel it – and know by touch if it’s too dry, too wet, under-mixed, whatever. For this bread, I went all hand-kneading as the recipe stated. 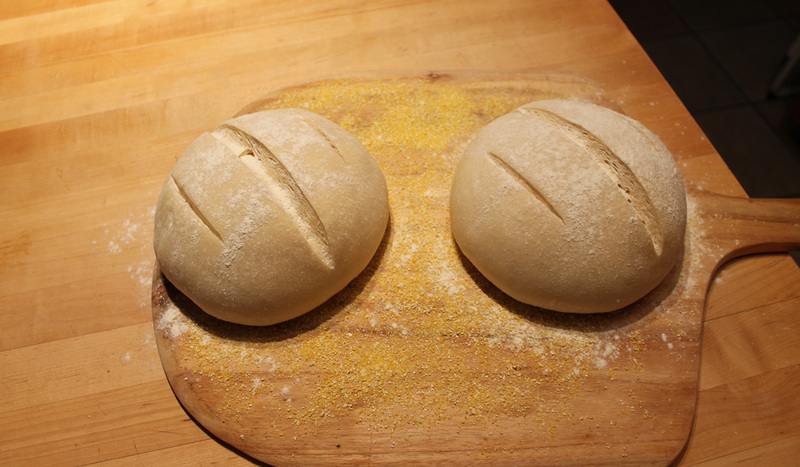 I do have to admit it felt good, and it does show that you really can bake bread without machinery. Mix together the bread flour, rice flour, and salt. Mix the water, beer, honey and yeast, stirring well. Combine the wet and dry ingredients. When mixed, tip out onto a floured counter. 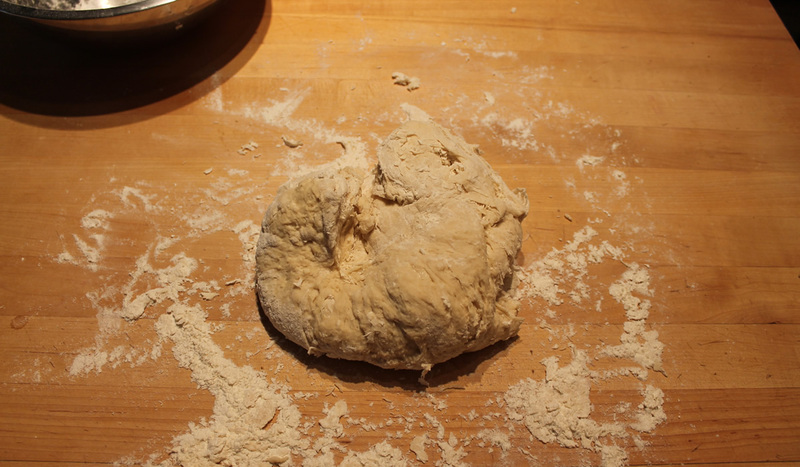 Knead by hand for about 10 minutes until you have achieved a smooth dough. 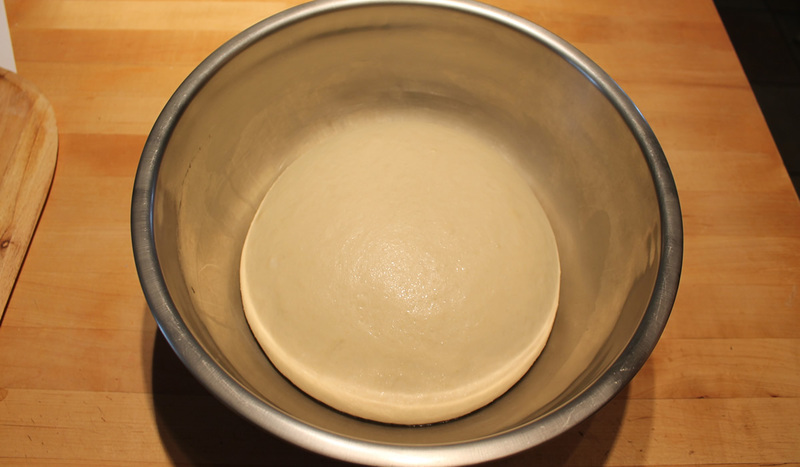 Place in a lightly oiled bowl, cover, and allow to rise for about 2 hours. 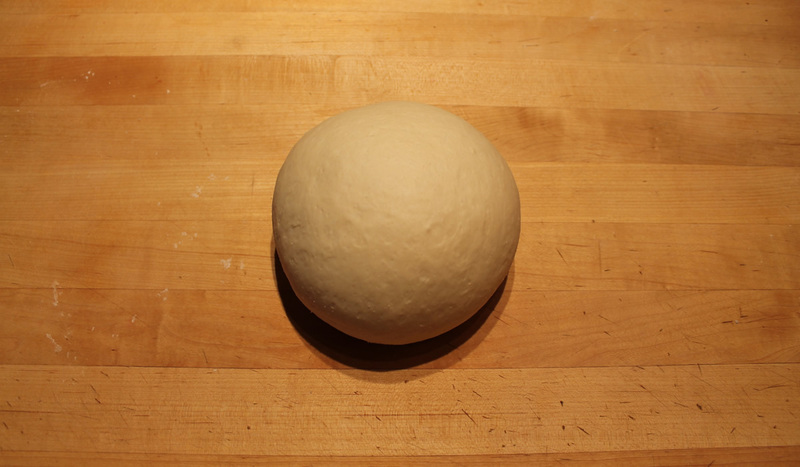 When the dough has risen, punch down and divide the dough into eight equal pieces for rolls or in half for loaves. Dust with flour and slash with a sharp knife. Bake rolls for 20 minutes or about 25 minutes for loaves. You’ll note that the loaves are more elongated rather than round. It’s because of the way I slashed them. 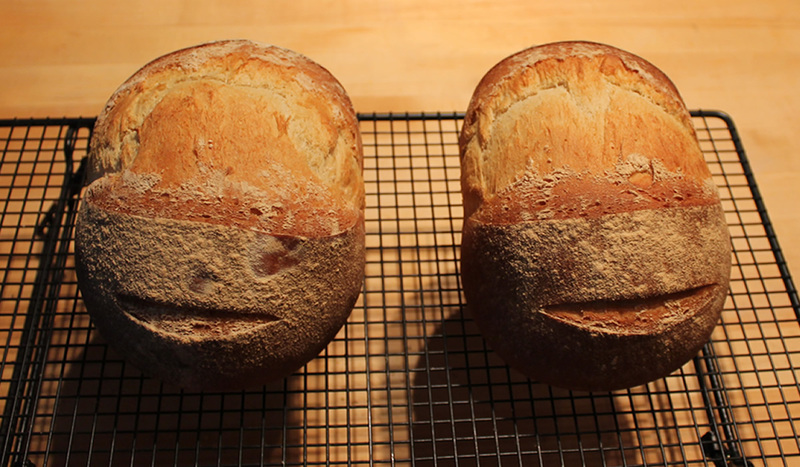 By slicing them in the same direction, the bread takes the path of least resistance and pushes back along the slit. 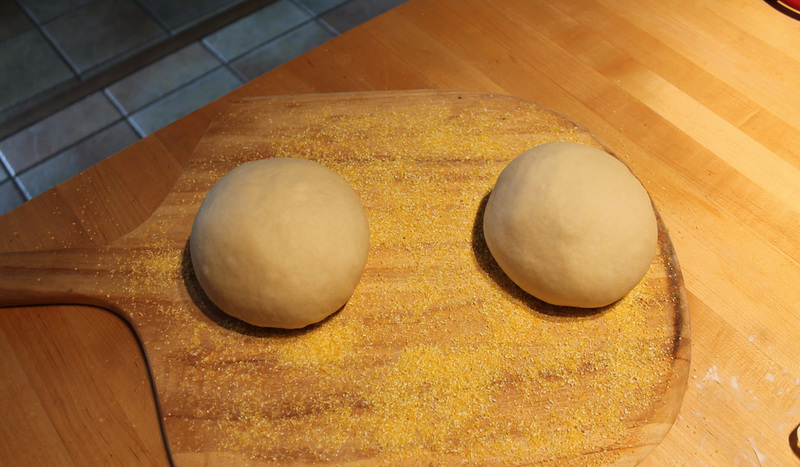 If I had made more of a cross on top – cutting equally in both directions – the dough would have remained more round. 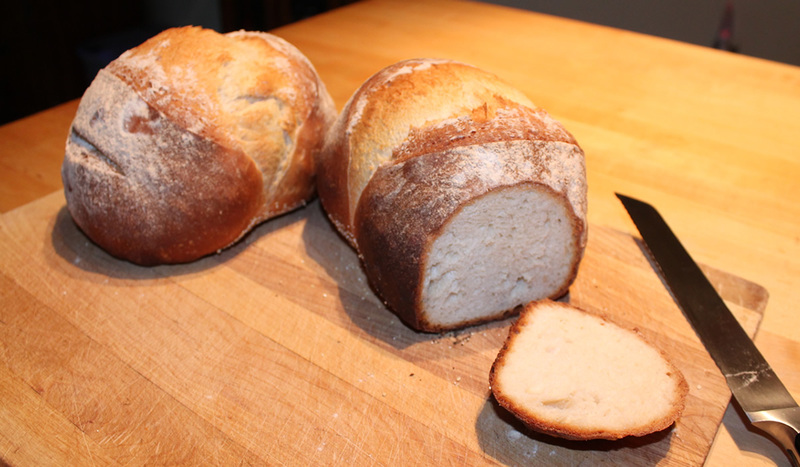 Different cuts will give you different looks – but the bread all tastes great! In the meantime, I may have found my new go-to loaf of bread! Everything about this bread is right – the crumb is light as a feather, the crust is properly crunchy and chewy – and the flavor is perfect!